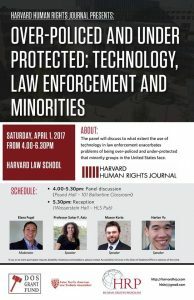 Join Mason Kortz from the Cyberlaw Clinic along with an all-star roster of speakers on April 1, 2017, at Harvard Law School about technology and law enforcement — “Over-Policed and Under Protected: Technology, Law Enforcement and Minorities.” Sponsored by our friends at the Harvard Human Rights Journal, the panelists will address the extent to which use of technology in law enforcement exacerbates problems faced by minority groups in the United States. A reception will follow. Panelists include Sahar F. Aziz of Texas A&M School of Law and Harlan Yu of Upturn, with moderator Elana Fogel from the Massachusetts Committee for Public Counsel Services.